We arrived in Japan a couple of days before the races to get into the different time and to get some training in. 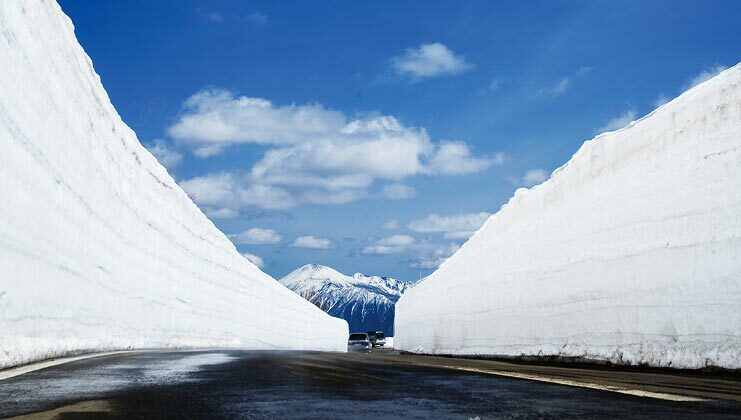 They have so much snow in Hachimantai - even in late April, the depth of the snow piled at the side of the roads was incredible and there was no grass or stones coming through on the hill. We were also happy to meet old friends here like the coach of the Mongolian national team (he is Japanese) and Hiromi Yumoto (ex World Cup racer-turned-coach) who invited us to use her training gates. After the last months, training and racing in Europe it was actually a nice change to have no cancellations; just an organised race where the draw (although electronic) was transparently held and where the races ran to time! I scored in the low 80s in both races. This was not bad since I had bib 43 and almost nobody failed to finish meaning that it was hard to get close to the top seeds. I am hoping to score better in Okutadami where I expect there will be fewer competitors so I should get into the top 30. Food was a problem here for me - it was very traditional Japanese. Although I have been here a few times and thought I was used to the food, this was a level above what I have experienced before and the idea of raw fish for breakfast every day did not appeal to me at all. Hachimantai was so remote, however, that it was a 40 minute drive each way to the nearest shop to buy some fruit juice, yoghurt and cereal in order to make breakfast, at least, more familiar.